Interesting Facts: Murkrow is a small bird Pokémon with black feathers. Murkrow's shaggy, feathery tail bears the resemblance of the end of a broom, especially with the small, short, red-colored rod-like beginning segment of it. 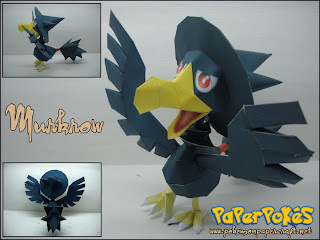 Murkrow has a crooked, yellow beak that resembles a witch's nose, a feather-crest that resembles a witch's hat and semi-circular eyes with red pupils. Murkrow’s neck seems thin in comparision to the size of the head it supports, with an extension of feathers on its neck like a collar. Murkrow has four toes on its yellow feet, three forward and one backward. NOTES: Follow the numbers while building, and refer to the included Edge ID pdf if needed to be sure of how tabs line up. Definitely refer to the pdo if possible, as the spikes of the tail get a bit confusing. Close at piece 48 (the chest). If you choose, you can opt for the simpler 2D wings included on the last page. Instead of making parts 20-37, make 57-60 and attach them in their place. Parts 57 and 59 will go in between the layers of 58 and 60, near the base of the wing, in order to create a '3D' surface to attach to the body. One of my favorites! This is so awesome.